From Ugli Studios comes issue 2 of their anthology Ugli Studios Presents. The first issue was reviewed here on the blog by yours truly, and I enjoyed it immensely. While the last issue had one story take up the majority of the issue, this one is a bit more evenly spread amongst the three stories inside, with The Painted Ladies of San Quentin spanning roughly half the book and The Courier and Thirteen splitting the remainder. Painted Ladies of San Quentin, written by David Paul with art by Jason Lenox, is a tale of revenge and redemption centering on Elijah Holman as he attempts to do the right thing, even when everyone else is trying to stop him. It appears to be at least somewhat based on historical happenings in the town that would one day house the San Quentin Prison. The Courier is a sci-fi tale by Brian Allen about a man who destroys as alien race and simultaneously saves and dooms an ancient society. Finally, Thirteen by Joseph Freistuhler is also something of a sci-fi story of a man and the horror that is himself. The art on all three stories is completely solid in its own way, but Freistuhler’s art stands out the most to me. The simple coloring, using primarily white and black as positive/negative space to form the characters was really well done and gave the entire story a fantastic look. Allen’s art on The Courier gives a great design to the aliens and their technology. Lenox’s art on Painted Ladies really worked well with the time period the story was set in and the action and gore that filled many of the pages. The writing by David Paul on Painted Ladies stood out, both due to the large cast of characters and the historical nature of the story. Historical fiction always fascinates me, and this story was no different. Allen’s story with The Courier is interesting, especially with the largely unknown nature of the backstory and the way the ending leaves the reader hanging. Freistuhler’s story with Thirteen is something completely different from the others. It’s much less straightforward and has a bit more sinister tone than the rest. Still, it’s an interesting little read. I would have to say that this issue is better than the first, something that I wasn’t expecting to happen. 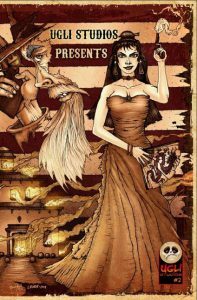 The three stories come together to make a wholly enjoyable anthology that gives the reader a good variety of story and art styles. If you missed the successful Kickstarter project for this issue, and are interested in learning more about Ugli Studios or getting a book, check out the Ugli Studios site. Parental Concern: Moderate. Violence, language.